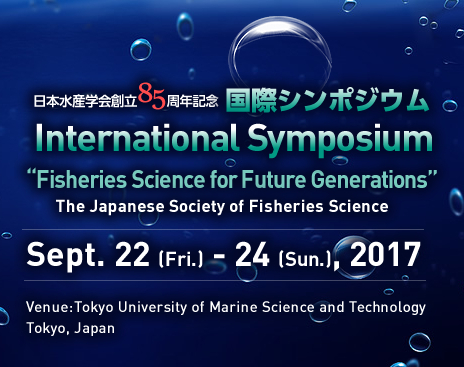 The Japanese Society of Fisheries Science (JSFS) was established in 1932 and is a non-profit registered charity, dedicated to the promotion of all aspects of fisheries science. The society fulfills its global commitment by promoting this science, striving to achieve sustainable development while recognizing crucial need of preserving the natural aquatic resources. It also strives to forego relationships with the industry comprising both capture and culture fishery, the fishing environment, and the concerned trade. It strives to future promote its activities and to realize funds for collaboration with national and international societies. In view of the global commitments, the society became one of the first members in the recently established World Council of Fisheries Societies. The wide-ranging activities of the JSFS have made a great contribution to the growth of marine science and technology. Nowadays, the society challenge to bring up especially boundary fields such as biological science, engineering, medicine, pharmacology, social science, and so on as well as interest fields of agriculture. These results make an actual and instructive contribution to the expansion of various fiels. The main event organized by the society is the annual meeting held in one of the main cities of Japan. In this forum the members present their research activities, exchange information, and create partnerships in vital areas of research. Over 1,500 presentations are given during the meeting and a compendium of the abstracts is published timely. Day-long symposia on contemporary issues are also a permanent feature. Awarded to members who have made outstanding achievements in academic studies and contributed to the development of fisheries science. Awarded to members who have made long-term contributions to the development and systematization of fisheries science. Awarded to members aged 40 or older who have made outstanding scientific achievements and contributed to the development of fisheries science. Awarded to members aged 39 or younger who have excelled in research and who are expected to make further significant contributions in fisheries science. Awarded to persons who have made technically distinguished achievements and contributed to the development of fisheries science as well as the fishing industry. The society is closely connected with local marine products industries by the seven branches, Hokkaido, Tohoku, Kanto, Chubu, Kinki, Chugoku-Shikoku, and Kyusyu regions, promoting scientific awareness at grass-roots levels and involving as many people as possible in the society. These branches independently hold local research meetings, lectures and symposia addressing issues relevant to their regions. Two or three local branches occasionally cooperate and hold joint meetings. The Journal is written mainly in Japanese and published bimonthly. This Journal, founded in 1994, appears bimonthly and contains papers and reviews in English.